A story from the Dreamspinner Press 2012 Advent Calendar package "Evergreen". Just a fast, fun, cute story. 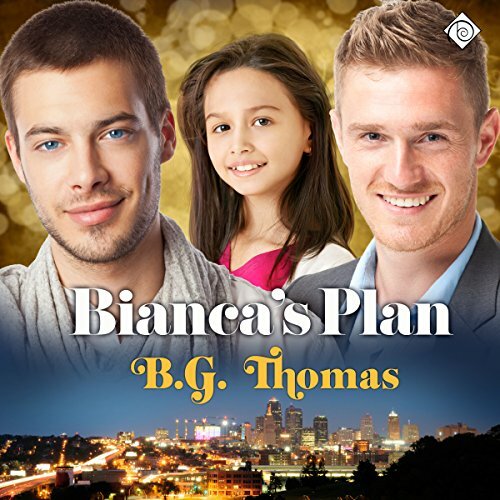 Would you consider the audio edition of Bianca's Plan to be better than the print version? I can't say, I've only listened. What was one of the most memorable moments of Bianca's Plan? I think I have listened to almost all of his audio's and this one is just as good as any. The man could read the phone book and have me entranced. Gavin and Curtis have been best friends for a few years now, and Curtis still remembers the night he realized that Gavin wanted much more than friendship. Alcohol fueled bravery and a few longing looks gave Gavin away. Curtis has never talked about it, and Gavin has never pushed, and the friendship has remained intact. But with Christmas approaching, Gavin’s daughter Bianca tires of their little game of cat and mouse and forms her own plan to ensure she wakes up Christmas morning with two daddies. Oh my goodness, this was just the cutest little story! And Bianca, that little pill, she seriously stole the show and is the smartest of them all. It was so much fun to sit back and listen to her wheels turn. And then to watch as Gavin went on several disastrous dates and all the while, Curtis is fit to be tied, and very confused as to why. A story about family, figuring out who you are, and staying true to how you fell because hopefully, you will get what you are longing for in the end. Narrated by Paul Morey and, let me just say, that man’s voice just flows like honeysuckle off the vine. He captured the mostly confident, but lonely tone of Gavin; the cocky, fun and as the story progressed, confused tone for Curtis; and oh my girl Bianca, she was adorable and don’t ask me how a grown man conveyed all that sweetness, but Morey sure did. If you are a fan of the MM genre, but don’t like the sexier stories, this is the perfect book for you. It’s not a fade to black moment, but it’s classy and clean and perfect for the setting of this particular book. It left me smiling in the end. This was a super cute listen with one of my favorite narrators, who does a great job as usual. It is short, but a great comfort read. Bianca (the kid) is a trip, with a cameo of Gabe from The Boy Who Came In From the Cold; as the MC lives in the same building. A little angsty, but no surprises or drama, just a sweet story of a girl trying to make her daddy happy. Not worth a credit, but great for under $5.00. Bianca, Gavin’s 10 year old daughter is trying to get her dad a boyfriend for Christmas. She enlists the help of their mutual, straight neighbor/friend, Curtis to set Gavin up on some blind dates, since Gavin has been alone for the last two years. Co-incidentally, two years ago is when Curtis moved in, and it’s no secret Gavin is harboring a huge crush on the straight guy. Curtis feels guilty about this crush so he elects to help Bianca, even though each set up leaves him angry and vaguely unsettled. Finally, Gavin meets someone on his own, and Curtis realizes that he has actually been deluding himself all this time, and he makes his move in a jealous fit. When the boys tell Bianca that they are finally together, Bianca admits that had been her plan all along! The last 20% was the couple exploring Curtis’s new explorations into gay romance and it was appropriately steamy. All in all I enjoyed the story and thought it was pretty funny and sweet. Paul Morey does another nice job. I love his deep bass voice that he gives to Gavin and he did some funny characterizations of some of the bozos Gavin ends up dating. This is another case where listening might be a bit more entertaining than reading, because the voices add some color to what might be a more vanilla story.